Following is an article written by Jan Haag (an edited version of this article was printed in a recent edition of the `India Currents' magazine published from San Jose, CA). Reproduced with permission from the author. Swapan Chaudhuri, one of the world's greatest classical tabla players, celebrates his fiftieth birthday this year. From India to America, England to Mexico, Canada to Nepal, Australia to the United Arab Emirates, in France, Germany, Italy, Thailand, Malaysia, Indonesia-wherever North India classical music is played, he is in demand as a soloist and as an accompanist. Over the last decade, he has given an average of 200 concerts a year. Chaudhuri's touring schedule is the kind of which aspiring musicians dream, but it is also a demanding, health-defying way of life. During a typical week not long ago, Pandit (the Indian title given to a distinguished and learned man) Chaudhuri taught a dozen classes at the Ali Akbar College of Music on Monday, Tuesday and Wednesday, then flew, on Thursday, to Los Angeles to teach, from noon to seven, at the nearby California Institute of the Arts. Friday, he gave a concert in West Virginia. Saturday, he did two recording sessions in New York City. Then, on Sunday night, he performed at a commemorative event at Lincoln Center to celebrate Gandhi's 125th birthday, the guest list of which included, Dr. Venkatraman, India's former President. "It's not the concerts that are difficult," he says, "but the traveling, the constant traveling. And trying new things. At times dangerous things," he laughs, his eyes sparkling, then adds: "Tabla is limitless. I never want to stop." In India, a number of years ago, he gave eight performances in less than twenty-four hours. "They were all major concerts. I started first with Pandit Ravi Shankar at 7:00 P.M. From there, all over Calcutta, I played with Pandit Nikhil Banerjee, Ustad Amjad Ali, Pandit Jasraj, then a solo, then two dance concerts with Pandit Chitresh Das, then with Pandit Bhimsen Joshi..." his voice trails off. "How can you even get around Calcutta that fast?" "At night it is not so crowded." "Do you eat between concerts?" "Before a concert I don't like to eat. I drink just tea. You don't need food, the energy just comes. When you enjoy something, you forget about yourself. Some kind of special power generates in your body, you don't get tired." In 1969, when Ali Akbar Khan returned to Calcutta from an extended stay in America where he had just created the American branch of the Ali Akbar College of Music, he invited the twenty-four year old Swapan to his house to play for him. "I played for maybe half an hour. Khansahib was impressed. He decided that I should play with him that year in concert at the Tansen Music Conference. It was a very important concert, the first concert that Khansahib gave after he returned from America. He took the risk." Swapanji pauses, reflecting on the memory, repeating, "He took the risk. For no one knew me at that time. But by then my love of tabla had begun to develop. It was no longer just what my father told me to do." The concert, with the already world-renowned Ali Akbar Khan, was a great success. It was after that, when musicians began to call the young tabla player asking him to play with them, that Chaudhuri decided to become a professional musician. "My practice changed and increased. To become a concert musician is very difficult. In India, if you're not from a musician's family, it takes a very long time to establish yourself. Slowly, over the next few years, I began to be known. I sought out musicians. But I was often rejected. I remember once sitting on the stage and a musician refused to play with me." Swapanji pauses, "But maybe it was good for me, I learned tenacity, I learned determination, I knew that one day those same musicians who rejected me would come to ask me to play with them. After a long time, I began to enjoy some success." During those years, '69 to '81, Ali Akbar Khan invited him many times to come to America, but Chaudhuri was determined to prove himself first in India. "Even in '81 I didn't have the intention to leave India, but the school needed a teacher and Khansahib asked me to come. Also, my mother said, 'You should go this time. You should accept.'" Swapanji hesitates for a long moment, then adds: "It was her birthday. We were celebrating my mother's birthday. I had played three concerts the night before, and had to play one more at one o'clock. Then everybody came to our house, including Khansahib and his family. My mother cooked for everybody. We had a nice time and signed the contract. Then at night, just before 12 o'clock, my mother passed away. She had a massive heart attack. It was her fifty-third birthday, January 26th. There were seven or eight doctors in the house, but they could do nothing." At the Ali Akbar College of Music, which by then was permanently housed in San Rafael, Ali Akbar Khan had a succession of great tabla masters: Shankar Ghosh, Mahaparush Misra, Jnan Prakash Ghosh, Zakir Hussain. And, occasionally, Khansahib, himself, or Alla Rakha, Zakir's legendary father, would teach a tabla class. However, at the beginning of 1981, the school needed a new tabla master. "But I could not leave India," Swapanji continues, "I was too grief stricken. I could not leave my father. I did not want to go to America. As the eldest son of a religious family, there were many rituals I had to perform. Khansahib was very kind, he told me to take my time, to think about it." After several months, when Swapan's mourning duties were completed, Dr. Chaudhuri urged his son to join Ali Akbar Khan in California, "It was your mother's last wish, so you must go." "I arrived in America on May 5, 1981. I came to the College and I began to teach. The first concert I played in America was on May 9th." Swapanji sips from a cup of tea a student has brought him. "At first, being here was a terrible experience for me. My grief for my mother, it was a very difficult period in my life. I had left all my friends, my family, and much of my professional life in India. Nobody knew me. There were few Indian musicians here. It was so different, a whole cultural difference... "Khansahib, of course, treated me as a son, he was so kind to me, so loving. He still treats me like a son. I am his son. There's no doubt about it. Even though I'm now fifty half a century, he still scolds me, he gives me love, it is all combined. He was giving me so much affection at that time, trying to loosen me up, like teaching me to cook. I didn't know how to make a cup of tea. I didn't know how to boil the water. "I was living alone two doors down," he nods toward the east from the College. "I was so lonely. I taught five days a week, Monday, Tuesday, Wednesday, Thursday, Friday," he counts the days on his fingers, "and watched television on the weekends. Sometimes the students used to come, they'd bring tea from here. But they were also busy, they were all working. It's a hard life in America. It's not an easy life. It took me a long time to get used to it. "I left in November and came back again in April, '82 for Khansahib's sixtieth birthday. We had a concert, a great concert. That picture," he indicates a picture above the red-carpeted dais where he sits to teach, "is from that concert. I gave many many concerts. I threw my whole life, my whole spirit into playing. I played in such a way as to give the audience all my knowledge, all my love of tabla." During the '80s, with endless practice time and drawing on the profound emotions that ensued from his cultural displacement, Chaudhuri's performances became displays of a dazzling virtuosity. With an amazing depth of emotion, a crystalline beauty of tone, a clarity of stroke, incredible speed, awesome variety, charm, wit, and a charismatic playfulness Chaudhuri simply mesmerized the audiences of America. He played with the many distinguished Indian musicians and dancers who came more and more to perform in the West, as well as with Western musicians trained in Indian music. Then he began to tour Europe, Asia, and the other continents and countries of the world. He played not only for sarod and sitar, but for sarangi, and santoor, for vocalists, for flutists and for dancers. He played solos, and with symphony orchestras, string quartets, and with other percussionists. "Each one" he says, "is different, not only the instrument, but the person, the situations. Each artist you play with is unique. You have to listen very carefully for the bols, for the instruments, the dancers, the different drums, are all different. Each is an art in itself." And always, he continued to play with father, mentor, guru, Ali Akbar Khan, adding to their many years of intimate association. Today, after several decades and fourteen years of continuous association at the AACM, they have become as finely attuned to one another in performance as any of the greatest masters of Indian music. He also began to teach at other universities in the United States, Canada and at the Ali Akbar College in Basel, Switzerland; but until Swapan Chaudhuri married Jane Rockwood his life was not truly anchored in the West. Jane Rockwood Chaudhuri is also a musician. Her studies of North Indian classical vocal music began in 1978 with Laxmi G. Tewari at Sonoma State University. Then, at San Francisco State University with Jnan Prakash Ghosh, who taught both at SFS and at AACM, she studied tabla. When Ghosh returned to India, she came to study vocal music with Ali Akbar Khan at AACM and tabla with Zakir Hussain. When Swapan Chaudhuri arrived, she began to study with him and, at times, assisted in teaching. The love of music drew the two together. Married in 1988, Swapanji and Jane now have two young sons, Nilanjan and Ishan. Recently, when the older child, Nilanjan, turned five, he came to his father and said, "You started to play when you were five. You promised me when I was five you would teach me." "He likes a new composition at each lesson." Swapanji chuckles. "I encourage him to practice with his mother. She is very good. They both devote some time each day to the tabla. When the children are old enough, Jane would like to study again." "Does she want to play professionally?" "I don't think so. To be a professional is a whole different thing. It's a commitment, a life long commitment." Now at fifty, secure in his accomplishment, Pandit Swapan Chaudhuri divides his time between performing and teaching in America, his rigorous world-wide touring schedule, giving concerts and performing at the great festivals all over India each year during the winter concert season, and teaching in Calcutta. Having helped propagate the knowledge of and love for Indian music around the world, he also devotes an increasing amount of time to an ever deeper exploration into the sources of his art. He finds great meaning and beauty in the traditions handed down generation upon generation during the tabla's four hundred year history. Recently he has presented many of the old compositions of the Lucknow Gharana. "I always try to learn more through my music," he declares. "I analyze my playing. I think the truth is that if you can satisfy yourself, people who are listening will be satisfied. "As you grow older, you see things differently. It's not: 'I am controlling tabla.' It's like when you do the puja, when you go to church, your whole attitude is very different, you surrender yourself. I am under tabla's control. I surrender myself because I know there is nothing I can show to tabla. It becomes more and more like melody. The joy, the happiness I don't think I used to get that before." Chaudhuri says that when he plays he often goes into a trance-like state. He does not know beforehand what he will play, nor, at times, after a concert, is he conscious of what he has played. "Sometimes I don't know until I hear the tapes." In the last few concerts he has introduced traditionally based compositions that incorporated pakhawaj bols. The pakhawaj, a two headed drum, is thought by some to have been "cut in two" to become the ancestor of the tabla. Its deep base tones are particularly associated with chanting and dhrupad singing. These passages in the open more resonant, pakhawaj style, played mainly on the baya, have electrified and bewitched his audiences. When asked about them, Swapanji shakes his head and smiles: "It was a surprise, even to me." Then he adds: "The art is in the bass drum, the left hand. The right is all brilliant speed and restlessness, like a child running about, but the depth, the mood, the rasa, the beauty that tabla speaks comes from the left hand." Though many cannot follow Pandit Chaudhuri's explorations into melodic and mathematical structures, nonetheless, all can enjoy the rhythms he discovers. Instinctively, music lovers respond with delight as Chaudhuri arranges time and sound into myriad, magnificent, multifaceted patterns. For pattern, rhythmic, mathematical pattern, as ancient Indian philosophy as well as the relatively new Theory of Chaos proposes, may be at the very heart of creation. 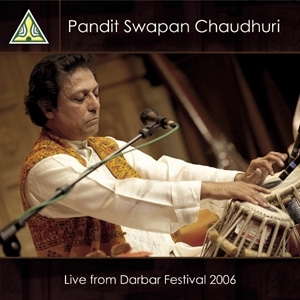 To hear Swapan Chaudhuri in concert is to share his love of tabla, his love of drumming, his generosity. At times he is like a little boy giving you a treat, his eyes laughing from under long black lashes, at times he is stern, at times majestic, at times he throws back his head to laugh with delight. At times the rhythms become so exhilarating, so intense, that suddenly the heart stills, the breath slows and, like being in the eye of a hurricane, it is like listening to silence. It might be said there is here, living among us, one of those legendary figures you read about in Indian musicology, that Chaudhuri may have, like Tansen, the great musician of the sixteenth century, "a power so great that he can, with his music, talk to the birds and animals of the forest, bring rain, as well as change the hearts of gods and men." Joyous is the single word that springs to mind when trying to characterize Chaudhuri's art. He plays the tabla with a profound elegance and a contagious joy.